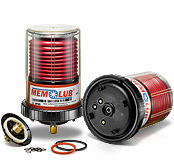 The MEMOLUB HPS lubricator is an autonomous single/multi point electro-mechanical lubricator. Its high lubricant ejection pressure of 25 bar opens a wide range of applications not possible with conventional systems. Memolub HPS can be used remotely, up to 8 meters from the lubrication point. Remote installation avoids dangerous or difficult access points allowing maintenance personnel to work in safety. Machine stoppage for lubrication (impossible access, moving components, etc) can be avoided by installing Memolub HPS. Memolub HPS can also be used as a small central lubrication system. Combined with progressive distributor blocks, multipoint (up to 8 points) lubrication is a simple, economical way of reducing maintenance costs. Memolub HPS replaceable cartridges are available in a wide range of grease and oil products and come in 3 sizes (120cc, 240cc and 480cc).